Four bakers who were trapped in their shop for two days during Hurricane Harvey made hundreds of loaves of bread for victims. The workers from Mexican bakery El Bolillo in Houston, Texas, were trapped inside due to the level of water on the streets. 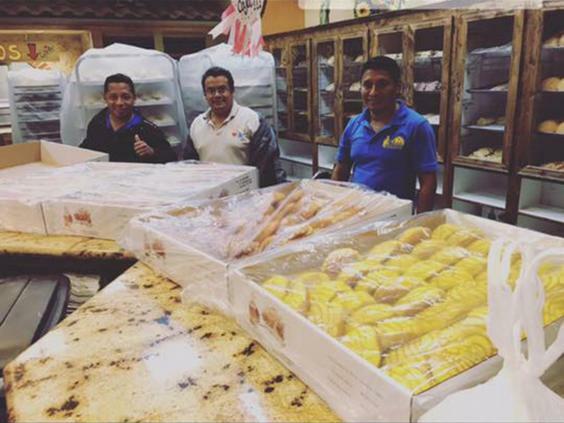 Luckily though the bakery – which specialises in Mexican cakes and patisseries – had not been cut off from electricity and so the bakers worked through the night and the following day in order to help those who had been affected by the floods. Although they didn’t count the exact number of loaves made, the bakers did used nearly 2,000kg of flour, to make bread and pan dulce – Mexican sweet bread. When they realised they were stuck, they decided to keep themselves busy and help the community and made as many loaves of bread as they could. By the time the owner managed to get to them, they had made so much bread we took the loaves to loads of emergency centres across the city for people affected by the floods. The bakers decided to make all the bread not only to help others, but to try to take their minds off their friends and family, who they were worrying about. When the bakers returned home, only one of them found his house to be damaged due to the floods. U are amazing! Ur bread has been shared and enjoyed by so many during this crisis. Ur compassion and willingness to help is a great example. It really was an amazing selfless act which ended up helping hundreds of victims.